11/18 Collected Poets in Shelburne Falls, MA. AND...I will be on a new books panel at the conference, Poetry-by-the-Sea in Madison, CT. May 22-25, 2018. Thank you Kim Bridgford! 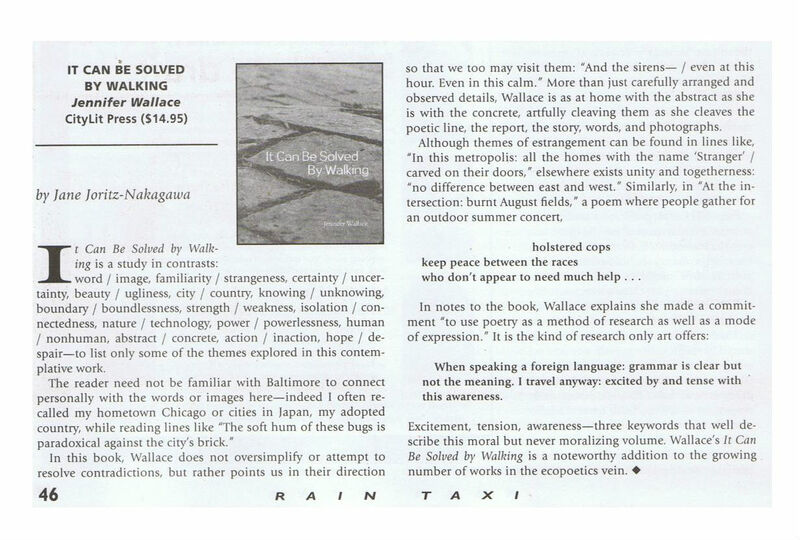 Jennifer Wallace’s book, It Can Be Solved by Walking, was inspired by countless hours spent exploring the city on foot. The collected poems, essays and photographs reflect on the intricate balance between man, nature, and the built environment. Lisa Morgan met up with Ms. Wallace for a conversation and stroll through one of her favorite neighborhoods in town, Bolton Hill. America Magazine, Just a Day, The Wind of God, & When the Wing Gives Way.